Praxis Advisory Group, Inc. is a small business local to Denver, Colorado. They provide portfolio management services to families and individuals. The company has been around since 1992, and in 2016 decided their visual brand needed an overhaul to match the current company direction. Letter 13 Creative also worked on creating consistency between Praxis Advisory and their sub-brand: InvestAcademy. InvestAcademy is an educational class offered to the public that teaches financial self defense and portfolio self-management. 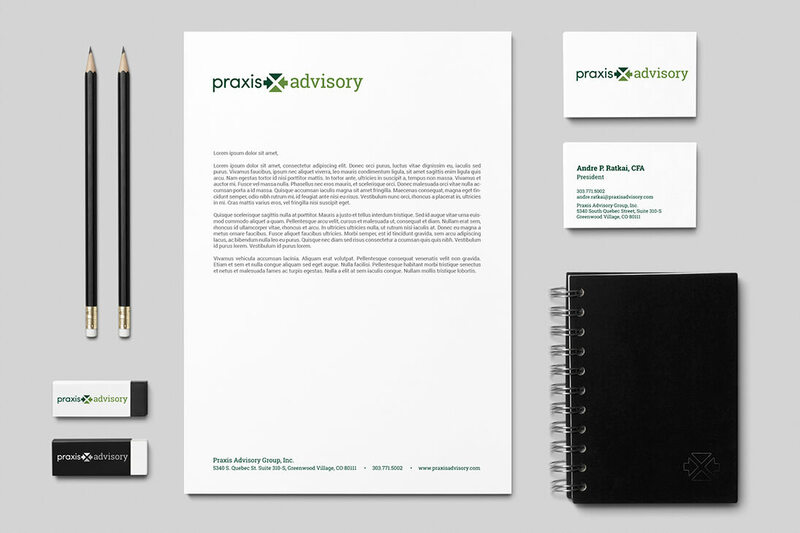 The concept of Praxis' re-brand was developed by understanding the relationship between the company and its customers. Praxis Advisory prides itself on creating long-lasting, personal relationships with their clients - contrary to many of their competing firms. As a family run business the well-being of their clients and the well-being of the management team's family is directly related. This relationship is brought into the design through the use of two closely related typefaces and the illustrative mark. The mark creates an intersection of four elements, like the intersections of relationships the business is founded on.